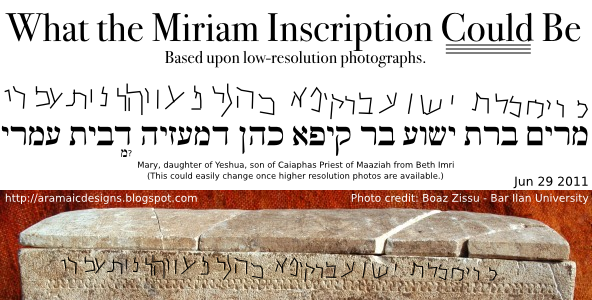 “Miriam, Daughter of Yeshua, Son of Caiaphas” Inscription Announced | XKV8R: The Official Blog of Robert R. Cargill, Ph.D.
You just know that good old Simcha is hustling up some sensationalist crap based on this right now. Israeli Antiquities declared it authentic. yep, i don’t doubt it’s authenticity. Thanks for your commentary. I especially like it when you anticipate and/or counter the sensationalism. Hey, I enjoy your blog and have subscribed to it because you I like your perspective. I wasn’t sure how to contact you but I was wondering what your opinion was on this story in USA Today about a new algorithm to determine different authors in the bible. Of course Jesus existed. He predicted the fall of Jerusalem and the Temple. He was arrested by the Jewish authorities, beaten, then handed over to the Romans who scourged him, questioned him, and eventually killed him. Jesus son of Ananias, that is. Apollonius of Tyana isn’t the only one you can play this game with. thanx for your comment. yes, the text authorship algorithms are becoming increasingly useful, but still not perfect. their evolution is following that of ocr and voice recognition software (like google voice) or even google translate. they still miss things here and there, but they will be fined tuned over time, and once they are, they will be quite helpful. for now, i suggest learning the language you want to study from a credible scholar, and purchase accordance. It looks like the letter after כהנ might be ב; you rightly noticed and filled in the base stroke of the letter, but it looks to me like the base extends to the right (where you didn’t fill in), which makes the letter look more like a beth than a mem. This would yield the singular “priest in (the course of) Maaziah,” which fits better the syntax of the inscription. that’s a good observation. and it yields the same result. it does look like the mem to the left, and i really don’t see the dalet. a yod doesn’t explain the base stroke (very well), so the mem or your suggestion of bet work best. thanx!! (2) According to t.Yeb 1.10, the high priestly family of ‘the house of Qayafa’ (this confirms that it is a family name) came from Beth Meqoshesh, an unknown place (see CIIP vol 1, p 483). This COULD be the place from which the Miriam ossuary is said to have come. What provenance do the Gospels have? good point. since the gospels are all anonymous collections of edited and copied accounts of jesus written decades after his disappearance, we must evaluate these texts with many of the same critical approaches (if we want to be consistent). one difference is that these are texts, and that the texts existed in numerous variant copies for centuries before an ‘official text’ (if you will) was determined (and still after that there were changes). Wow an atheist Biblical archaeologist. How depressing. You are apparently of the Dawkinsonian type of atheists since in reading your blog I see you are unable to restrain yourself from making numerous ‘ad hominem’ barbs at people of Biblical faith. Arrogance and condescension are not fine qualities in any person let alone one presuming to be a representative of scientific truth. Everyone has biases and various presuppositions, the good scientists are at least honest about it and don’t let it cloud their writing. i don’t know you, and you obviously don’t know me, but the point in this article is that a peripheral reference to caiaphas does not speak in support of or against any historical claims about jesus. this inscription has nothing to do with jesus, but that will not stop some from drawing the conclusion that ‘since they found an ossuary of miriam, and mariam’s grandfather was caiaphas, and since the bible says caiaphas conspired against jesus, all claims about jesus must be true.’ this is simple false logic; the ossuary supports no claim for or against jesus. as people of faith, we are free to believe whatever we want. but as scholars, we must stick to the facts. Look at the very last word. 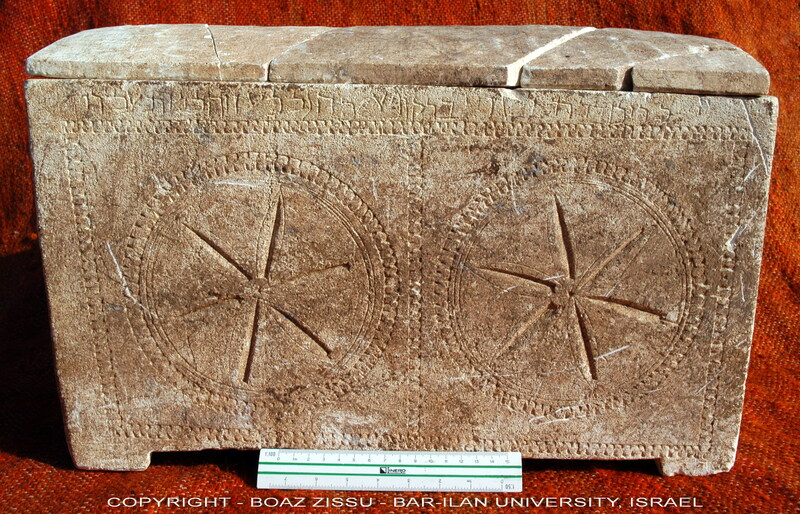 If you’re image of the inscription is correct, the last word (the name) is “עמרי” which is ‘Omri’ not ‘Imri’. The difference between ‘Imri’ and ‘Omri’ is the same as the difference between ‘Aleph’ and ‘Ayin’ (Ayin inspired the Greek Omicron and so is more akin to “O” than “I”). I’ve written Prof Zissu and he claims the last word (the name) is “אמרי” (with an ‘Aleph’) rather than “עמרי” (with an Ayin). Yet the first letter of the last word looks the same as the middle letter in the word “דמעזיה” in your etches which is most certainly an ‘Ayin’ (when compared to the last letter in “קיפא” which is an Aleph.